Every time I make this dish, and I make it lots, I’m surprised by it — surprised by how much I enjoy the process of making it, of stuffing halved peppers with a little bread-crumb mix, some herbs and as many small tomatoes as I can fit into them; surprised by how beautiful the dish is as I’m assembling it and again after it’s softened and charred in the oven; and surprised by how all kinds of people love it. The first layer of bread-crumb stuffing packs bright flavors: anchovies, lemons, herbs and seasonings. The top layer’s got the sweetness and acidity of the tomatoes. Be generous with the herbs — before you put the peppers in their baking pan, slick it with olive oil and shower it with a mix of herbs and slices of garlic. I like to have thyme in the bouquet, rosemary too, but parsley, basil and mint are all good players here as well. You may or may not have oil left over for dunking or remoistening the peppers, but that’s not the point — this oil-and-herb landscape seasons the bottoms of the peppers and adds another layer of aromatics to the dish. Since the recipe multiplies easily and endlessly, and because it is good at any temperature, but best, I think, at room temperature, mark it as a party dish. Center a rack in the oven and preheat it to 425 degrees Fahrenheit. Put a deep-dish nine and a half-inch pie pan (or similar-size baking dish) on a baking sheet lined with Gefen Easy Baking Parchment or a silicone baking mat. Spread a tablespoon or two of the oil over the bottom and sides of the pan, then scatter over the garlic slices, half of the herb sprigs and half of the basil and season with salt and pepper. Stir the bread crumbs and anchovies together in a small bowl. Grate the zest of the lemon over and squeeze in the juice from half of the lemon (about one tablespoon; precision isn’t important here). Cut six thin slices from the other half of the lemon, then cut the slices in half; set aside. (If any lemon remains, squeeze the juice from it over the bread crumbs.) Stir in one tablespoon oil and season the crumbs with the piment d’Espelette or cayenne. Taste to see if you want some salt (anchovies are salty, so the seasoning might be just fine). Bake the peppers for about one hour (check at the 45-minute mark), until they’re as soft as you’d like them to be — poke the side of one with the tip of a paring knife to judge. The juices and oil should be bubbling and the peppers charred here and there. Remove and discard the herbs from the top of the peppers. 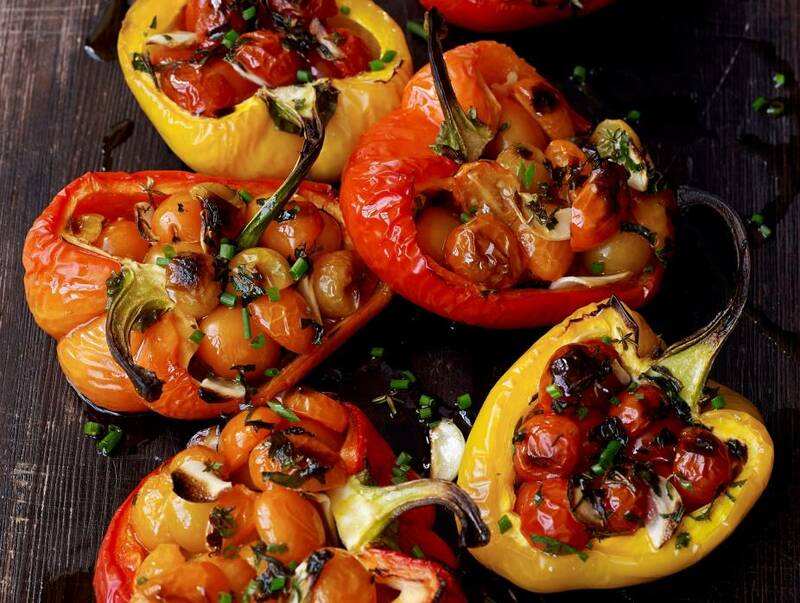 You can serve the peppers straight from the oven, warm or at room temperature. If you’d like, drizzle them with a bit more oil, top them with a little ricotta (adding a dollop of ricotta is particularly nice if you’re serving the dish warm as a starter) and sprinkle with chives or other herbs. Piment d’Espelette: Espelette is a village in the Basque region of France famous for its red chile peppers — after harvest, almost every house in the area hangs peppers out to dry in the sun. Once dried, the peppers are finely ground. Cayenne is a good substitute. Working ahead: You can prep the peppers a few hours ahead and keep them covered in the refrigerator; let them sit at room temperature while you preheat the oven. You can also roast them a few hours ahead and keep them covered at room temperature. Storing: I think the peppers are best the day they’re made, but if you have leftovers, refrigerate them — they’ll be soft but still tasty a day later. Oven-Charred Tomato-Stuffed Peppers is excerpted from Everyday Dorie © 2018 by Dorie Greenspan. Photography © 2018 by Ellen Silverman. Reproduced by permission of Rux Martin Books/Houghton Mifflin Harcourt. All rights reserved.